Okay, time to knock off the demi-human trio. Fairly simple work, I added a highlight on their cloaks, another highlight of splintered bone on their skulls, and then flocked their bases. While I was highlighting the bone, I also did the same to the other skeletal figures. I also painted the bone handles in Hecklemeyer’s hands, and the minotaur’s stone hammer head. Moving on from there, I decided to work on the dragonborn skeleton’s shield. The shape of it doesn’t really lend itself to the same iron crown, so I went with the mace design. I’m not sure who the lich lord has doing his skeleton’s shields, but it clearly isn’t anyone with any particular skill. With that, the minotaur and dragonborn skeletons are based and done! Next up, DEATH. Since the robe is the majority of the mini, it was time to deal with that. Nightmare black was the base, and I don’t want to brighten it up too much, though it needs highlighting, I started by adding a bit of runic purple, and then some spectral white, and then hit it all with a black wash to bring it down again. The Dust King got some Cursed Gold accents, the fur on the robe was painted with a 50/50 Succubus Kiss+Earth Brown base coat, brought up to pure Earth Brown, and then with some Dirty Bone highlights. I decided to base him and DEATH the same as the rest of the skeletons, in part because it’s easy and it ties them all together visually. Also because I wasn’t really sure what else to do with them. Plus, as they’re tabletop pieces, I didn’t want to over focus on basing. 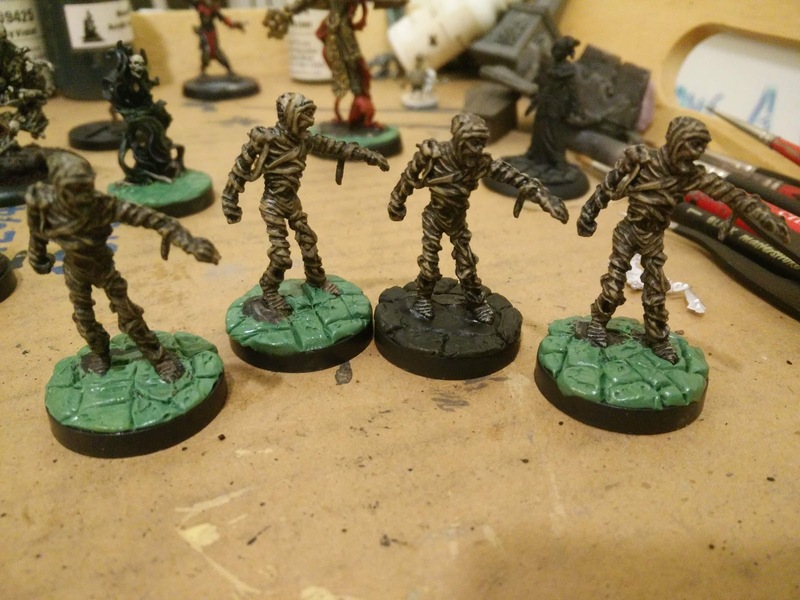 The mummies got a little attention, but mostly just their bases. Unlike the rest of the undead, I don’t see these guys strolling through a grassy yard, and I don’t have anything based in the desert, so dungeon it is! A little bit of greenstuff and a sculpting tool, and they’re now on flagstone bases! The Demi-litch also wasn’t going to cut it with some grassy turf, or even dungeon floor. I wanted to do a fancier base, so I’m gonna try for tiles. We’ll see how this works out. You can sort of see him hanging out behind the mummues.